During the summer of 2007, Medford resident Paul Tanimae and Marlton resident John Jenks had an idea stemming from the soccer training company they co-founded, AKKA Soccer. Together, they decided to organize a completely unadulterated club, the AKKA Street Futsal League, where kids could play without having to worry about the politics often associated with sports leagues. In its ninth year, this league runs for six Wednesday nights from late June through the end of July from 5:30 p.m. to 8:30 p.m. at Freedom Park in Medford. Each team gets to play two 24-minute games per night of play, and skill levels vary from novice to the much more advanced players. During AKKA’s first season, seven teams participated with a total of about 35 players. Consistently since the third year of play, AKKA has retained about 18 to 20 teams, and in 2014 it had to organize a second night of play because 27 teams signed up to play. 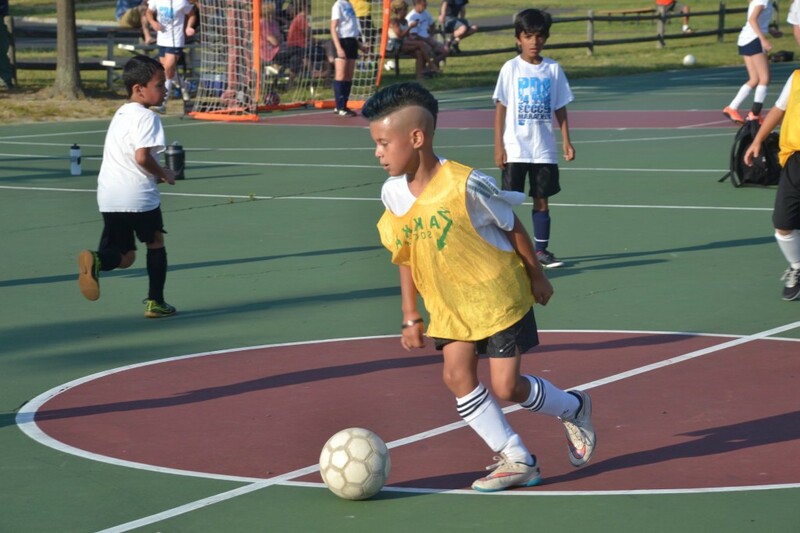 Most of the players this year, ages U9 to U15+, come to AKKA from PDA Soccer in Westhampton. However, in the recent past, the league has had participants come from Medford Soccer Club and Marlton Soccer. Since its inception, AKKA has also had trainers from the Amsterdamsche Football Club academy in Holland come play with the league. In the area for a couple weeks in both 2013 and 2014 running camps in Medford, these trainers were all former professionals from one of the world’s most famed producers of professional soccer talent. “They were impressed with some of the players and more with the fact this kind of street soccer was happening right here in New Jersey,” Tanimae said. Over the years, AKKA has evolved to feel much more organic. At first, Tanimae and Jenks, who met in 1999 as teammates playing amateur men’s soccer, would send emails listing a specific team schedule. They also used to have an adult sit on the bench with each team to make subs for players, but this made the founders feel adults were too heavily influencing the league. Today, adults sit around the courts in chairs and bleachers to simply watch and cheer. Although the local area clubs seem to be going in a different direction than AKKA, Tanimae and Jenks are considering starting a second night of play in Mercer County — where there is a rich soccer tradition — within the next five years. They hope more kids in the area will find out about their league, participate and benefit from the free play and boldness it inspires.